From left to right) Johan Swanepoel of Weder, Kauta and Hoveka Attorneys , who was one of the sponsors, Christo de Vries, Managing Director of Bank Windhoek and members of Welwitschia Insurance Brokers’ team, Steve Basson, Adri Vermeulen and Jacques Theron, who were crowned the champions of the Bank Windhoek Golf Day in Aid of Welfare. The Bank Windhoek Golf Day in Aid of Welfare raised N$130 000 for various charity organisations, N$10 000 more than last year. The funds will be distributed amongst various charity organisations in the country. The money was raised through the entry fees paid by the participating teams and the auctioning of several items signed by sports legends, and other fund raising activities on the day. The event which was held last week Friday, at the Windhoek Country Club, had 33 teams compete in a 10-hole golf course. The event was graced with the presence of selected sports legends and personalities, namely, Marnus Kruger, Gerrie Scheepers and Hendre de Vries, who formed the loose trio that entertained the golfers at the prize-giving ceremony. Johan Heunis, a legendary Springbok fullback, was also present at the event. 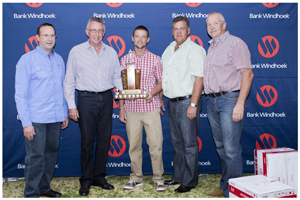 “Bank Windhoek was pleased with the outcome and participation in the Bank Windhoek Golf Day in Aid of Welfare. Bank Windhoek is especially grateful to the sports legends who came from South Africa, as well as all the team members, most of whom hold high positions in the local industries, for availing themselves from their busy schedule to play golf in aid for welfare”, said Riaan van Rooyen, Head: Corporate Communication and Social Investment at Bank Windhoek. Welwitschia Insurance Brokers were crowned the champions of the Bank Windhoek Golf Day in Aid of Welfare, followed by Nampower in second place and Executive Excellence in third place. “A big thank you goes to our partner sponsors that made the event possible, namaely, Pennypinchers; Capricorn Asset Management; Kalaharis Sands Hotel and Casino; AVIS Car Rental; Jaylo Productions; Distell Namibia; Peppercorn Restaurant; Harlief Rooftop Bistro; Wecke & Voigts and Embassy Bottle Store. Bank Windhoek, together with the sponsors and players, have once again illustrated that ‘Together We Do Better’”, Riaan said.